Counsel Press has been invited to present its renowned CLE program "Appeals: How to Take Them and Win Them" to members and non-members of the New York City Bar. This program focuses on practice in New York appellate courts as well as the United States Court of Appeals for the Second Circuit. Attendees will learn the methods for bringing and perfecting appeals in the Appellate Divisions, how to manage the limited appeals jurisdiction of the New York Court of Appeals, and the many filings that are performed in the Second Circuit. Once the procedural aspects of appellate practice are understood, the attorney presenters will provide practical tips and strategies for writing powerful appellate briefs and delivering persuasive oral arguments.The program concludes with various ethical considerations facing appellate practitioners and landmines to avoid. This CLE seminar will be held on Wednesday, July 27, 2016 (6:00pm - 8:05pm) at the New York City Bar Association, 42 West 44th Street, New York, NY 10036. Registration for NYC Bar members is $199 and $299 for non-members. Counsel Press clients can receive a 25% discount by calling 212-382-6663 to register. You must mention you are a Counsel Press client for the discount. New York Credit: 2.5 total: 2.0 skills & 0.5 ethics. 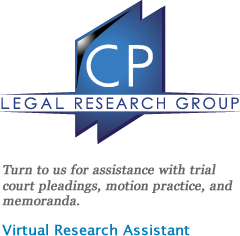 This live program provides transitional/non-transitional credit to all attorneys. Counsel Press offers a series of appellate CLE courses. The company regularly hosts appellate seminars at its headquarters in New York; it also presents its individual CLE courses at law firms and prominent legal organizations throughout the country. 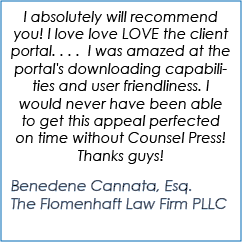 For more information or to bring Counsel Press' appellate CLE course(s) to your organization, please contact our Director of Marketing Yelena Balashchenko.